Quick overview Human beings naturally desire knowledge. But what is knowledge? Is it the same as having an opinion? Highlighting the major developments in the theory of knowledge from Ancient Greece to the present day, Jennifer Nagel uses a number of simple everyday examples to explore the key themes and current debates of epistemology. What is knowledge? How does it differ from mere belief? Do you need to be able to justify a claim in order to count as knowing it? How can we know that the outer world is real and not a dream? Questions like these are ancient ones, and the branch of philosophy dedicated to answering them - epistemology - has been active for thousands of years. In this thought-provoking Very Short Introduction, Jennifer Nagel considers these classic questions alongside new puzzles arising from recent discoveries about humanity, language, and the mind. Nagel explains the formation of major historical theories of knowledge, and shows how contemporary philosophers have developed new ways of understanding knowledge, using ideas from logic, linguistics, and psychology. 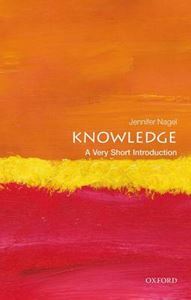 Covering topics ranging from relativism and the problem of scepticism to the trustworthiness of internet sources, Nagel examines how progress has been made in understanding knowledge, using everyday examples to explain the key issues and debates ABOUT THE SERIES: The Very Short Introductions series from Oxford University Press contains hundreds of titles in almost every subject area.